Even if my own gardening skills are lacking, I'm blessed to have friends who give me produce from their gardens. This salad was made from our publisher's arugala - a peppery, mustardy green with the texture of spinach - and crisp radish from our neighbors Ricky and Barb. I toss them with garbanzos, petite peas, cucumber, egg and balsamic vinaigrette. The drive along Sivley Road to get to our apartment is fragrant with wild honeysuckle. The smell reminded Joe of jasmine tea. I thought I'd put a sprig in the vase we got in Ilan, a village known for its pottery in Taiwan. It's our third spring in Hopkinsville, and our third family of bluebirds. Babies can only hold their big heads up on those spindly necks for so long. When I first open the box, all the heads pop up and the faintest wisp of a whistle comes out of the open beaks. Then, one by one, they give in to gravity and flop back into a restful heap. For some reason blogger has done something a little annoying. My posts are posting out of order so it appears I just had an early memorial day meal one week late. Not liking this new feature. So we didn't cook out for our pre-Memorial Day meal. But these crab cakes from *cough* sam's club cooked up really nice in the toaster oven. The main comment at our dinner table was how crabby they were... just the bare minimum of bread to hold lumps of genuine crab together. My crab cake is seen here with spring mix on a Schlabach's "Special Dinner Roll." I wanted to do a column on strawberry picking...and so while dad and Joe were off fishing with Ricky, Mom and I went out to Elkton to get U-pick strawberries for 75 cents a quart. We decided it's a lot of work picking strawberries in the hot sun if you're a)29 weeks pregnant or b)in your fifties. But we came home with lots and lots and lots of strawberries. 2008 Little Rivers Day eats: Tasty treats or overfried duds? The variety of vendors at this year’s Little River Days Festival turned Founders Square into a deep-fried wonderland last weekend. Festival food is usually over-the-top in calories and price. There’s often interesting combinations that festival goers would never dream of creating in their own kitchens. This weekend I gathered some willing accomplices and set out to find the best of the fair fare. Together, we managed to sample eight items and make it out of the festival without going into cardiac arrest. My picks? Sweetater fries, fried green tomatoes and funnel cakes are the treats I’ll be looking forward to at next year’s Little River Days. R&L Catering had at least two booths at the fair this year and typically drew long lines of snackers. While the use of the term “ribbons” makes this dish sound exotic and yummy, I found this it to be a little disappointing. For $5, you get a paper plate loaded with fairly bland, slightly overcooked, spiral-cut potato chips. Warm chips are a novelty and the volume of “ribbons” is generous, but flavor is lacking. I let my husband finish this dish after trying a handful. Perhaps barbecue flavor or salt and vinegar could have saved them. If you crave homemade potato chips now that Little River Days has ended, Livingston’s Butcher Shop and Deli on North Drive usually serves thick, hearty chips still warm from the fryer. $3 at What About Bob? This distinctive booth features a grass table skirt and parasol. Bob Denton himself reached through the tiny window of his vintage trailer to pass a cardboard tray of well-done sweet potato fries to his cashier, Judy Simon. Simon said that the fries, along with the fish sandwiches, were their best sellers. I shared my fries with a friend, Emily, and her twin 4-year-olds Philip and Esther. Like the potato ribbons, sweetater fries come without much adornment, so I squeezed ketchup in one corner of the tray. My friend had hoped they would be sprinkled in cinnamon and sugar, but I thought they tasted great slathered in ketchup. Esther tried one fry and said, “I thought they were bacons.” Philip seemed to enjoy them more and said he liked his with ketchup as well. The cashier at R&L said that this item, which featured six large slices in a crispy batter, along with the blooming onion, were their most popular sellers. This was one of my favorite snacks — the balance of batter and tangy tomato was just right, and they were nicely seasoned with salt and black pepper. Emily and I also comforted ourselves with the thought that we were eating deep fried vegetables, which added a little bit of nutrition to our meal. Three plump pork ribs draped over two slices of white bread is not my idea of a conventional sandwich. But the Pioneer’s knew what they’re doing. The bread simply serves as a way to blot up the extra grease and sauce from the meat, though Emily did tear off a few pieces. I found the ribs to be rich and flavorful, though the edge piece I had was overcooked to the texture of jerky. The meat nearest the bone, on the other hand, was very tender. We both liked the thin, tangy sauce that was available in a squirt bottle at the stand. While most concession stands come from out of town, Pioneer’s is a local institution. Funnel cakes, with their pull-apart structure and heavy pile of powdered sugar, are the quintessential carnival food. I can never pass them up, even though I have been disappointed. Sometimes the confection isn’t fully cooked and reveals an oozing and unsanitary batter center, other times it’s overcooked (or refried?) and becomes tough and chewy as soon as it has cool. There’s no mountain of sugar that can cover up those mistakes. The funnel cake at R&L was perfectly cooked. While Emily and I were working on the ribs, Philip had pulled apart and consumed half the cake. When we were ready for our portion of the dessert, he declared, “I had too much of a good thing!” and then asked mom if he might have one more bite. When I first heard about these from Recreation Department Director Pam Rudd, I was eager to try them. Chocolate dipped fruit sounded almost too gourmet to be at a spring fair. My imaginations might have set too high a standard. Marty Lane’s strawberries are frozen and skewered three to a stick. The strawberries were deep red and the size of a child’s fist. I like the idea of being able to eat whole fruits, but frozen solid, these were tricky and teeth-tingling to consume. Also, I felt the chocolate coating had very little chocolate flavor. They seemed to have been stored in a freezer case where they absorbed a dozen flavors from the other snacks stored there. Next year I’ll just dip my own strawberries. A whole banana, kebabbed and coated in the same low-quality chocolate shell as the strawberries, this dessert was softer and a little easier on the teeth. But it was merely a substitute for the stand’s popular chocolate-coated cheesecake, which had sold out by the time my husband got there. Again, Joe and I liked that we could find something semi-healthful amid the deep fried Oreos and candy bars. He seemed to enjoy the dessert, but I found the lingering mystery flavors in the coating distracting. You didn’t think I was going to pass this one up, did you? This dessert didn’t know where to quit. The chocolate-coated snack cake with crème filling gets an additional chewy donut batter coating. It’s served on a stick and sits in a pool of chocolate sauce, beneath a mound of powdered sugar. My teeth hurt just thinking about it. Joe and I thought it was pretty good, at first bite. But we both agreed it would have been better if we had a third person to share it with. I don't think I've had too many urgent cravings, Joe might disagree. 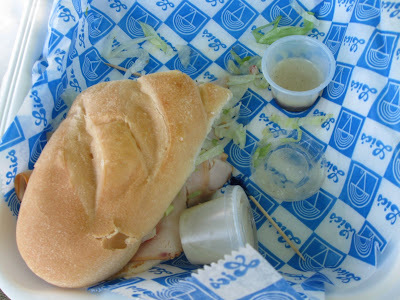 But last Wednesday I had a hankering for a turkey sandwich from Lic's with extra house dressing. Wednesday was also yet another day so crammed full of work activities that I didn't really even have time for lunch. Joe offered to pick some up for me and so I sent him on the mission for the turkey sub with no cheese or mayo and extra dressing. Poor guy, first time it came with cheese and mayo and no dressing. He sent it back. Second time it came on buttered toasted bread with no cheese, no mayo and no dressing. That's what he brought to me. No dressing? That was the ingredient in particular that I was craving. So I refused to eat the sandwich, like a pouting 5-year-old. I made him hand over the reciept, and declared I would make Lic's make it right. By now it's 1:30 p.m. and the hungry pregnant woman's wrath and determination is mounting. I stopped at the deli on my way to another assignment, in the New Era car. A couple of Lic's employees were sitting outside the building on break. One of them jumped to her feet and ducked in the side door as soon as I lugged myself and the faulty sandwich out of the car.I must have looked a little cross. Anyhow, I got the sandwich I wanted with extra dressing and was offered cookies to assuage my grief :) After covering my assignment I parked myself on a park bench and enjoyed a belated lunch before rushing back to the newsroom. Tuesday I stopped at the Founders Square farmers market at lunch. Rossneau Ealom was selling pattypan squash 3 for a dollar. They were so cute, I couldn't pass them up. He also had asparagus, strawberries, scallions and greens. Tonight I decided to cook each squash differently. First we have Italian style with egg and cauliflower. Then dredged in flour, salt and pepper and sauteed. Then stuffed with bread cubes, itself, cheese and a little ham. Joe is rather fond of the new bluebird pair, especially the mom becaues she will often stay on her four eggs even when he peeks through the little round hole into the box. She peeks right back. I got this shot today when she had already gone for a little bug break. Just thought I'd share these blooms with you all. All four of my African violets are blooming now. This one was given to me by Emily Chappelear last winter. Last weekend Joe and I went to Cincinnati for the Flying Pig Half Marathon, which both Joe and Jack were running in. Now, I didn't take a single picture of the race or the city or even Jack and his lovely girlfriend, Oriole, who is here from Australia. But I did manage to get shots of our lunch at Thai Taste restaurant, where they let your choose your spiciness on a 1 to 10 scale. I enjoyed the (spice level 4) panang curry-- it tastes very much like Urbana's Siam Terrace panang, but it is served with steamed brocoli rather than crunchy just-cooked greenbeans. I liked it immensely. I was only sorry that I couldn't finish it all. Oriole had the green curry, which also looks pretty yummy. That evening, we enjoyed a hot homecooked Italian meal at the Stehura's, where we all stayed. Joanne made shells and cheese, spaghetti and meatballs, a salad with lots of finely chopped veggies and bread twists with cheese and Italian seasoning. For dessert, we played Blokus and ate some milk duds. The next morning, the brothers Parrino got up at some ungodly hour so they could be at the starting line for the Flying Pig before 6:30 a.m.... and that's Eastern time, so for Joe it felt like 5:30. Thanks to confusing mapquest directions, odd road signage and the lack of a map, Oriole and I got an accidental grand tour of the city, as well as neighboring Covington, Ky. I think we traversed all of Cincinnati's bridges: the gray one, blue one and yellow one in our quest to get to the finish line to see them cross... alas. We got to the finish line and a gigantic sea of sweaty people clad in running gear and metallic plastic blankets. Then my cell phone rang and it was Joe, calling from the parking lot. We did manage to meet up with them in said parking lot. By some strange miracle, we ended up parking three cars down from them. Joe and Jack made excellent time, finishing the 13.1 mile race seconds apart in about 1 hour and 43 minutes. As of Monday I'm 26 weeks along. Appetite is hearty, and I feel like my stomach is giganto, but I suppose it doesn't look too scary in these pictures Joe took on Tuesday. After sleeping half the day away, I woke up and realized there were things in the kitchen that needed to be used and that I could use most of them to make a japanese meal. Those fishy catfish nuggets? I toasted them with garlic teriyaki marinade and sesame seeds to try to simulate the fried eel that's too expensive for me to buy, even though I really like it in sushi. Half a cucumber? Perfect for sushi and for salad. Eggs? To make tamago. Carrot sticks? I grated them, then mixed them with ginger, vinegar, sugar, miso, and soysauce to make that salad dressing they serve at Japanese restaurants. I must say, I'm in love with my Cuisinart hand stick blender... which I used to make the dressing. Tina Wang has inspired me to make my own baby food. I don't have a food processor, but I think this gaget will do the trick. I was feeling frugal and decided to make a bread pudding to get rid of some old dinner rolls and a spotty banana before we go on our trip this weekend. Caramelize butter and sugar, add bananas. Whip eggs, milk, vanilla. Toss bread with mixture. Let set 10 minutes. Add banana mixture. Add chocolate. Scoop into muffin cups, bake for 25 minutes at 350. They came out a little firm... I would have cooked them slightly less or added more liquid for a gooey-er texture. Emily and Ryan had us over for lunch last Sunday... where we dined on Emily's 5-ingredient chicken tortilla soup and quesadillas. She used chicken broth with garlic, canned tomatoes with mexican seasoning, frozen pepper and onion mix, rice and chopped chicken. Quesadillas with pepper jack and cheddar. Mmmmm. I keep making this for Joe and I. And whatever other vegetables on hand. Saute all veg with a little garlic salt. Boil spirals and drain. Toss with olive oil, vinegar, a little sugar, parmesan cheese. Serve warm or cold. Yum! These cookies actually came before last post's cookies. I made them from a recipe in "Another Serving"... yet another Kentucky cookbook sent to me by a publisher. Title: Another Serving: The Kentucky Monthly 10th Anniversary Cookbook What’s inside: As with other southern cookbooks, “Another Serving” offers up dishes replete with down-home comfort and calories. But amidst the cheesy dips and creamy casseroles there are a few healthful surprises like Fat-burning Cabbage Soup on page 30, Grilled Veggie Burger on page 100 and Faux Potatoes on page 122, which uses pureéd steamed cauliflower in place of spuds. food columns in Kentucky Monthly magazine,which celebrates 10 years this year. How it looks About every third recipe in the 122-page perfect-bound book contains a full-page color photo, usually cropped in close to show the details. In the kitchen: Several of the recipes require only a handful of ingredients and often use packaged convenience foods. and not overly tough on the teeth. I usually go for the soft and goey cookies,but I like the variety of textures that the coconut, cereal, oats and nuts bring to these hearty cookies. Cream butter and sugars together in a food processor or mixer until light and fluffy. Add the eggs, oil, oats, vanilla extract and salt and mix well. Add 1/3 of the flour and mix. Continue adding the remaining flour until mixed well. (You may have to transfer it into a larger bowl and mix by hand with a large wooden spoon.) Add the Grape Nuts®, coconut and pecans. Pinch off the dough and roll into quarter size balls. Place dough balls on an ungreased baking sheet and press down with a fork or with your hands. Bake at 350 degrees for 10 to 12 minutes or until lightly brown. Cool and store in an airtight container. Makes 6 to 8 dozen and can be stored in an airtight container for two weeks or longer. Where to get it: The Pennyroyal Area Museum gift shop and Books on Main carry the cookbook, which sells for $21.95.